Halloween door decorations turn any door in your home into a spooky entrance. 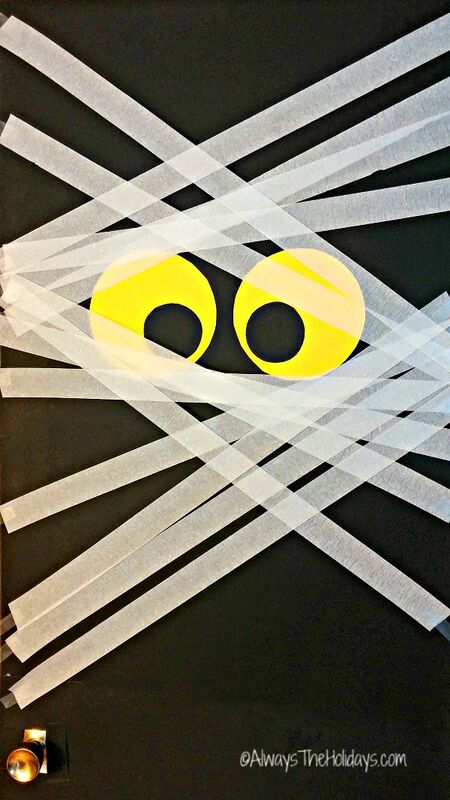 This mummy door decoration is super easy to do and perfectly eerie to behold. 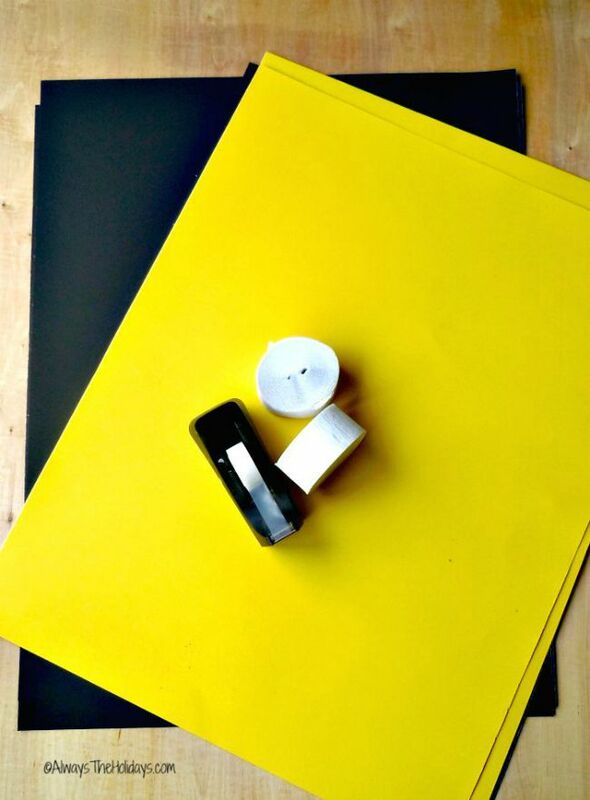 All you need are a few supplies and your door will be a Halloween masterpiece in no time at all. The door cover will make a great prop for your next Halloween Party or the front door of your house. How adorable is this? 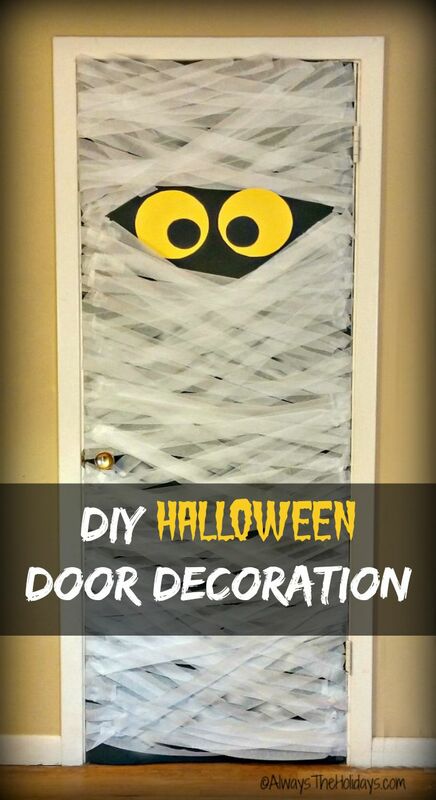 This mummy door decoration will delight your trick or treat visitors. You can do it on both inside or outside doors and the kids will love to help you put it together. Getting started on Halloween Door Decorations. Halloween is the time for mummies. I love to use the theme of this spooky monster in all sorts of ways. I made spooky mummy cake balls, and also pumpkin spice mummy truffles. Now it’s time for a DIY project featuring mummies. 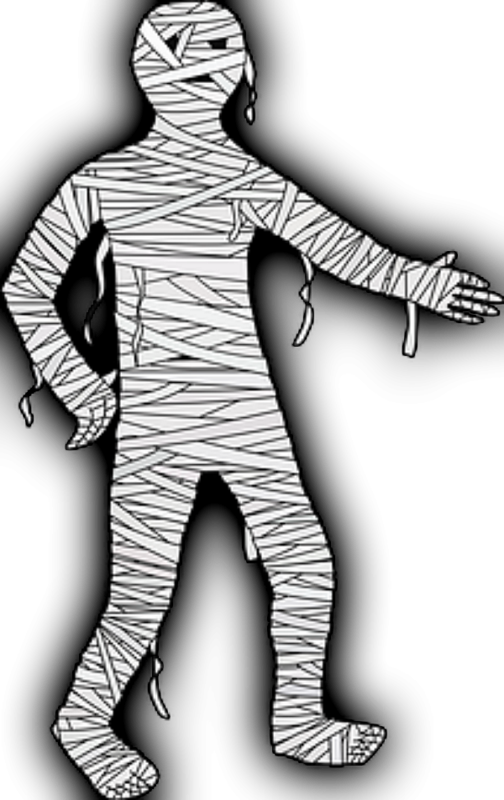 Who isn’t scared by the thought of a mummy moving around in your house? 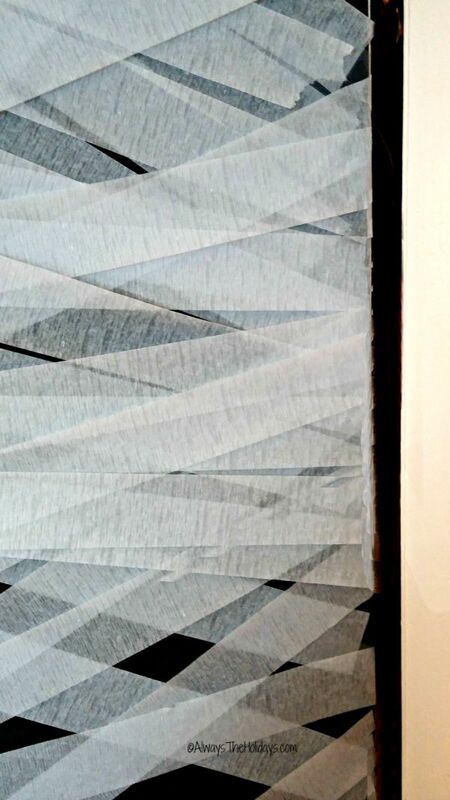 This simple door cover is the perfect way to set a spooky mood in your home on October 31! 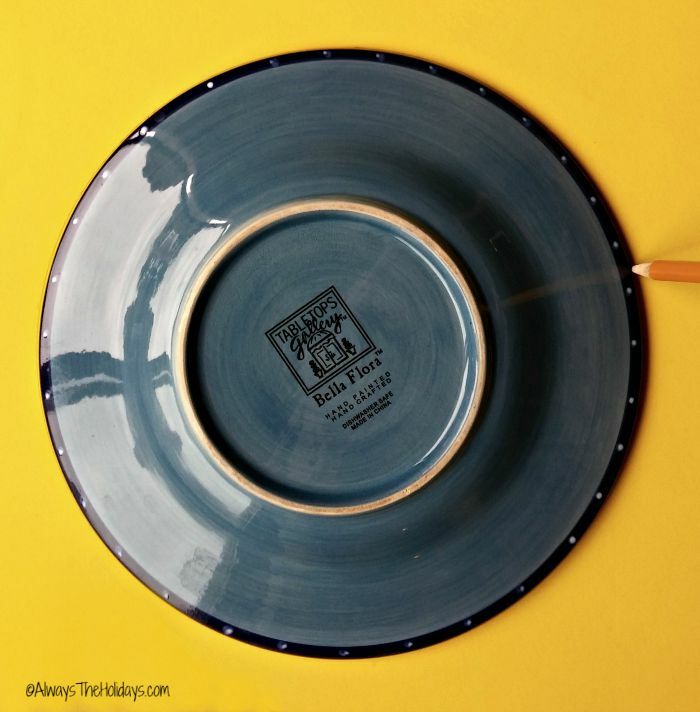 The project is fairly easy to do but takes a bit of time to finish. The longest part of the project are the criss cross mummy wrap sections, but I’ll show you a few tips to make this easier. 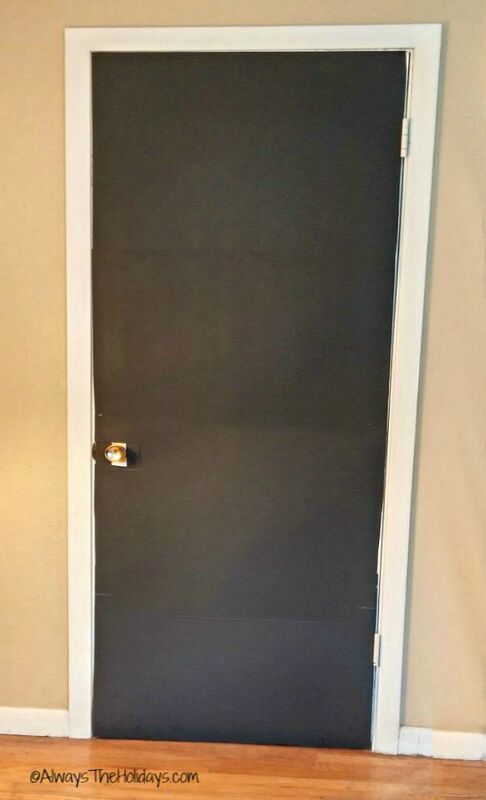 I started by covering my whole door with the black poster board (be sure to save one strip of it for the eyes.) I started by using the tape, but changed over to the Blue Tack. This holds the weight of the poster board up better and will work best if you plan to leave it up for quite some time. Using a lunch sized plate for the yellow eyeballs and a glass for the black pupils, trace the eyes and cut them out. Arrange the eyeballs and attach them to the black door covering with Blue tack about 1/3 down from the top of the door. Start to criss cross the whte steamers around the eyes. Arrange the white streamers so that the eyes show fairly well. Also, be sure not to do what I did! I started by walking back and forth to a table for each streamer. Let’s just say I got a bit of exercise before I figured out the short cut of cutting dozens of streamers and putting them on my lap with the tape near by. I love my exercise but not when I am making mummy projects! 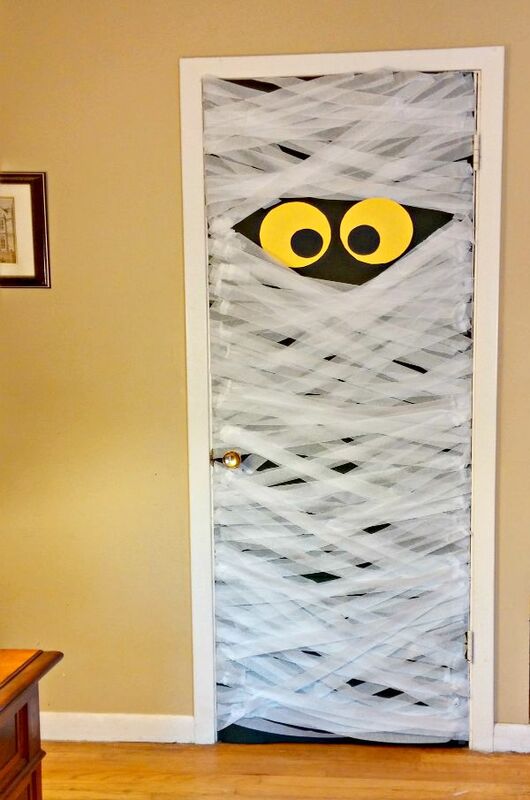 What a fun project this mummy door decoration is! Your Halloween guest will find it so much fun and it was so budget friendly. I was lucky enough to get all of my supplies from the local Dollar Store, so it only cost me $3.50. Tada! Here is my mummy in all his spooky glory! Looking for more tips for a budget friendly Halloween party? Be sure to check out this article on my my blog, The Gardening Cook. I adapted this project from one that I found on a school room classroom door website called My Classroom Ideas. What have you used for Halloween door decorations? I’d love to hear your ideas in the comments below. Disclosure of Material Connection: Some of the links in the post above are "affiliate links." This means if you click on the link and purchase the item, I will receive a small commission from the sale, but the price is the same for you. I only recommend products or services I use personally and believe will add value to my readers. I am disclosing this in accordance with the Federal Trade Commission's 16 CFR, Part 255: "Guides Concerning the Use of Endorsements and Testimonials in Advertising." Always the Holidays is a participant in the Amazon Services LLC Associates Program, an affiliate advertising program designed to provide a means for sites to earn advertising fees by advertising and linking to amazon.com. I earn a small commission if you purchase through an affiliate link but the price the the same for you. All content on this site is ©Carol G Speake (Always The Holidays) unless otherwise stated. Copyright © 2019 Always the Holidays. All Rights Reserved. The Magazine Premium Theme by bavotasan.com.